For the next several weeks in this season of Epiphany, the lectionary takes us to the beginning of Jesus’ ministry. Today our reading follows Jesus’ first two healing stories recorded in detail by Luke – one being the healing of Simon Peter’s mother-in-law when Jesus was at Simon Peter’s house. The gospel next reports that many were brought to Jesus for healing. Jesus departs to pray in a deserted place alone while he’s sought by the crowds who naturally want him to remain to do more marvelous works in their midst. Perhaps because of his time of prayer alone, Jesus declares to them: “I must proclaim the good news of the kingdom of God to the other cities also; for I was sent for this purpose” (Luke 4:43). He goes on his way to continue his mission, and then we hear in Luke 5:1-11 what next takes place. Listen for God’s word to us through this reading. In a few minutes, Allie will receive the Sacrament of Baptism. Like most of us raised Presbyterian, her journey with Christ begins by parents making promises for her. Family and friends committed to supporting her. A whole community of faith vowing to pray for her and nurture her faith whatever ways we can as she soon goes with her family to their new home in Texas. Like most of us, her path of following Christ will unfold gradually. No dramatic encounter with Jesus as we hear of in Luke’s gospel when Peter and his business partners James and John brought to shore boats overflowing with fish, then left it all behind to live out their call from Christ. I suspect that for Allie, as for most of us, discernment of the Way will unfold more like an opening cocoon. Slowly, when the time is just right. She’ll hear the stories of Jesus as we all have along our way. Learn the songs of faith. Figure out how it works best for her to pray to be connected to The Source in order to discern the steps to take each day. Maybe I’m pining for the past of how amazingly clarifying it must have been to have Jesus show up on the scene. Walk right into the vessel of your profession to transform a stinky old fishing boat into a pulpit from which he preached. Asking Peter to put out just off the shore that he could tell the good news of God’s kingdom. After Jesus’ Amen, his command to put out into the deep water to let down the nets for a catch, changed Peter’s little boat into a eucharist table – clearly showing the goodness of God! The fish overflowing in such abundance, Peter had to call James and John quick to come help! One commentator reminds that “More than a ‘natural miracle,’ the catch of fish also is layered with eucharistic allusions. (For) fish mean food, and wherever we read about fish in the Gospels, we are reading about the miracle of sustenance for the new community that Jesus is creating in the call of the first disciples” (Feasting on the Word, Yr. C, Vol. 1, Peter Eaton, p. 335). Wouldn’t it be wonderful on our own journeys as disciples to have such a clear, concrete sign of the sustenance we need? The food for which our spirits long that will keep us filled as a community and as individual followers of Christ each day as we serve wherever we are sent. I want that for little Allie – don’t you? And for ourselves. The miracle of the sustenance we need to grow more each day as Christ’s faithful disciples. That’s what we are. Through baptism: sealed with the outward sign that we belong to Christ. We have committed to being his faithful disciples! . . . But. How often we feel just like Peter does in the story: unworthy of God’s Presence. Not good enough to be put in service like Christ. Ill-equipped to proclaim good news. To speak of God’s work to re-create this world. How often we think our efforts aren’t enough as Christ’s disciples. Or that, like Peter, James, and John, the REAL disciples; the gig’s about leaving it all behind – becoming like a totally different person with a totally different life trajectory. And let’s face it: there’s about 0% chance most any of us are going to leave it all behind dramatically – willingly divest ourselves of our employment, our families, our homes, our investment portfolios to chase all over the countryside healing and teaching and enlisting outsiders in God’s resurrection movement! So, we decide being a disciple was for folks long, long ago. Ones first encountering Jesus of Nazareth when his ministry began. What does discipleship look like today? For folks like us who aren’t being recruited to begin what Peter, James, and John began world-wide because of Christ. What will being a faithful disciple look like for little ones freshly baptized – and for us, some baptized over eighty years ago? Recently I came across anonymous words that were written by someone on a spiritual retreat. I don’t know much about the person, but it seems the person was wrestling with what discipleship looks like today. The words read: “It is baffling to me, who always has been so driven to achieve, that I find myself at a time of life now in which I am driven to connect. To connect with companions and allow that process to unfold. To connect with the Holy and to allow that relationship to unfold. To connect with my deepest Self – and to allow that process and person to be revealed. So, the intended course becomes much more a following than a driven, planned-by-me direction. Is it all simply about following? Moments to decide still come. But it is as if I have committed to the unfolding – to following the Mystery. The allowing. The listening. The waiting. All shall be well, (as Julian of Norwich reminds). Intentions still arise, but they are different than I ever could have imagined for myself.” The retreatant then wonders: “Is this what Christ meant? Crucify your self – your need for your own plan, in order just to follow? Follow the nudge – the thread? The stirring of what brings you fully alive? Let the rest be. Then, might I heartily be able to say: ‘I HAVE decided to follow the Christ! No turning back. No turning back!’” (anonymous words from a spiritual retreatant). Is this what discipleship will look like for Allie, and for all of us baptized as disciples of Christ? Following the nudge. Paying attention for the stirring of what brings us fully alive. Allowing Way to unfold – sometimes waiting; always listening. Not frantically groping in darkness at the Mystery; but allowing the Mystery to call to us as who we are and how we are to be in the world each day is revealed through those ah-has. Those awakening insights that cause inner shifts. So, we see the world a bit differently. We willingly try new ways of caring – new ways of showing through action and word the good news of a kingdom in our midst. A reign residing in and beyond us that is the direction of our path. In a few minutes, little Allie will receive the Sacrament of Baptism. A reminder that the Light of Christ is in her and it is incumbent upon her, as she grows, to shine. Like Peter. Like James. Like John. Like Jesus. Like us: baptized in Christ, disciples of the Way, we are raised to the new life of following the Light to be light in the world for all to see. . . . Come! Let us gather at the font. Let us celebrate the baptism of the newest disciple of Christ! 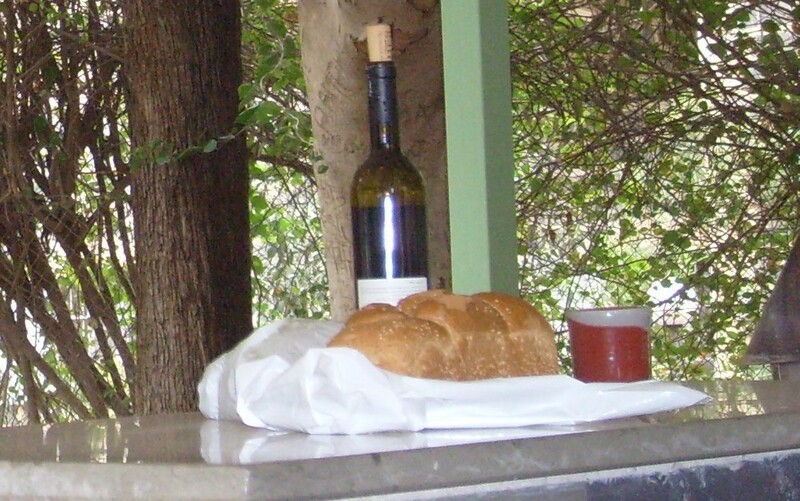 This entry was posted in Sermons and tagged 10 February 2019 sermon, Abundant Sustenance, Call, Christ's Disciples, Disciples, Disciples of Jesus, Discipleship, Discipleship Today, Eucharist allusions, Fish, Following the Way, Listening for Spirit, Luke 5:1-11, Sacrament of Baptism, Spiritual Retreatant Journal on February 12, 2019 by RevJule. A reading from the gospel of Mark 9:30-37. Listen for God’s word to us – and remember that the gospel records this as taking place shortly after Jesus is transfigured into dazzling white on the mountain before Peter, James, and John. Prior to that, for the first time, Jesus told what was to come of him – how he would be killed and rise again. Listen for God’s word to us in this reading of the gospel of Mark. Being a disciple of Christ is really difficult! Especially if you read things like the gospels. In particular the gospel of Mark. In this earliest written version of the good news of Jesus the Christ, which also is the shortest and most quickly moving; we have to wrestle with pronouncements from Jesus like: “If any want to become my followers, let them deny themselves and take up their cross and follow me. For those who want to save their life will lose it, and those who lose their life for my sake, and for the sake of the gospel will save it” (Mark 8:34-35). No sooner does he gather the crowds to tell them this, than he takes his closest followers away to repeat himself saying: “The Son of Man is to be betrayed into human hands, and they will kill him, and three days after being killed, he will rise again” (Mark 9:31). Who wants to hear the charismatic teacher they just left everything to follow make pronouncements like: “The Son of Man must undergo great suffering, and be rejected by the elders, the chief priests, and the scribes, and be killed” (Mark 8:31)? Whether his disciples realized Jesus was talking about himself, or if – as the Greek suggests, the Son of Man meant something more general like the Human One. As in the True Human – or the One living their true, full humanity; who among us wants to sign up to be on Jesus’ Team when he keeps on talking about really tough stuff? Sure, he’s telling them about rising after dying – a cycle they knew well as those living close to the land. But certainly few could fathom the kind of rising again Jesus would experience. Do any of us really want to register to follow one who says we have to be last of all? Servant of all – which means, as one commentator reminds: “The person who was ‘servant of all’ was the lowest in rank of all the servants – the one who would be allowed to eat only what was left after everyone else had eaten their fill” (Sharon H. Ringe, Feasting on the Word, Year B, Vol. 4; p. 95). As if being the last one, the lowest in the household rank isn’t humbling enough; Jesus grabs a child to drive home his point. “If you want to welcome me and the One I embody in full,” Jesus says, “welcome one such as this” (Mark 9:37). Nodding down to the fragile bundle shockingly in his arms, this amazing Rabbi likens welcome of him and the One he embodies to welcoming a little child. We’ve loved this story in the church. Seeing it as a sign of our sweet Savior, our Tender Lord taking up into his arms the wee ones of the world. Yet, that same commentator who clarifies what it means to be the servant of all, reminds that “Mark’s audience would have heard the word ‘child’ as referring to someone like the servant who served meals to everyone else in the household, in that both were seen as without ‘honor’ or high social standing. A child did not contribute much if anything to the economic value of a household or community, and a child could not do anything to enhance one’s position in the struggles for prestige or influence. . . . Children and servants were of equally low social status” (Ibid., p. 97). So why? Why did Jesus pick up a child as a symbol about which he spoke? As his followers were arguing about the things of this world – jockeying for position in hopes of being first in the line of the world’s greatest disciples; Jesus held a baby. In welcoming one such child, what in the world was Jesus asking us to embrace? Downstairs in the fellowship hall this week during our preschool’s afternoon hours, I was reminded of a few truths about children. Guided into the room by two teachers, the little ones couldn’t even reach high enough to turn on the light by themselves. One fell down almost as soon as he entered the room. Two others had to be reminded that they needed to share the toy both of those little twos had claimed at the same time. “Each take a turn,” I heard the teacher say. Suddenly a little voice below me was telling me his momma was at work. His daddy was coming soon. What a pleasant surprise when I looked down to see our precious little Ziggy who we’re watching grow each day! Every few minutes I’d hear his little voice again, telling me the latest of import to him. One such as those little toddling two-year olds are amazing gifts! Yes, they are gaining more independence each day. Ask any mother of a two-year-old how that can be! But they remain incredibly reliant upon the big people in their world. Little children require big people. From the start they need us to feed them and clothe them and ensure they feel safe. Generally, they can’t get themselves very far in this world – figuratively and literally too. They can’t drive until at least 16! Depending on the make-up of our personalities when we arrive at our birth, and the circumstances created by the big people in our lives; we are and remain reliant for about the first 18 to 25 (or so) years of our lives. Some of us fight against that more than others – as is a part of the process of growing into healthy, contributing-to-society adults. But for the most part, children are reliant. And not all bothered by the fact that they are. Unlike the self-sufficient, go-it-on-your-own value held as great in our culture, is Jesus wanting us to embrace reliance? Children are authentic too. I love that about them! They haven’t yet learned of the social masks the world wants us to wear. They just are themselves. Whether bashful or bombastic; ready to take on the world or more observers of all the action; children don’t know yet how to hide who they truly are. Think of a baby. When they are hungry, they cry. When happy, they squeal! When something strikes them as funny, they laugh. When they experience pain, they seek comfort. It’s only as we grow older that we learn what the culture in which we are raised thinks appropriate. In order to fit-in, we are taught to modify who we authentically are. To pay no attention to what’s really going on in our body, mind, and soul. Just adjust to the behavior expected of us by the big people all around. . . . It’s such a crazy journey we go through in this life – learning how not to fully be ourselves for the sake of sheer survival, only later in life to have to unlearn all the ways we’ve not fully been ourselves in order to thrive as the blessed ones God has created us to be! Children truly are unstained by the world – free, at least at birth – to be our authentic selves, which may be the only way we have courage enough to let God be truly God – and others themselves too. True to who we are; there’s enough space for all just to be. Unlike the fitting-in-at-all-costs value held as great in our culture, is Jesus wanting us to embrace our authentic selves? Children also wonder. Easily. Often. And sometimes annoyingly to the big people in their lives. Children ask why? They marvel at creepy crawly caterpillars on the ground – usually at the very moment momma or daddy are trying to rush them out the door before they’re both late for all the day holds. Children stop to smell flowers. And want to look up at the stars. They love to play in the sandbox and stomp in muddy puddles no matter how dirty they get. Look at a three-year-old on their birthday right before blowing out the candles on their cake. They’re not afraid to let their whole body show their great excitement – awe at the beautiful moments of life. Unlike the drive to produce – and more and more more quickly – value held as great in our culture, is Jesus wanting us to embrace wonder? What would it look like to be disciples who heartily welcomed reliance – upon God and one another. Defiant of cultural pressures to think we’re self-sufficient, ones able to go it all alone. Unwilling to accept anything other than the truth that we are inextricably bound to God and one another. What would it look like to be disciples who heartily embraced authenticity – genuinely appreciating the marvel that each of us is so that we all would be courageous enough to be ourselves? If not everywhere we go in the world, then at least among our families and friends and church. Because we each are a particular gift given by God to this world. Beings with certain skills, experiences, and passions that God desires to be used for the highest good of all. What would it look like to be disciples who absolutely cherished wonder? Which is the purest form of worship. Time and space simply to behold the beauty of Creator. Relish the joy of all creation. Open yet to newness instead of stuck in ruts of certitude. . . . Long ago Jesus took up a child to teach what it looks like to be great. Unlike the values of our culture, Jesus defines the greatest as those at home in reliance. Authentic in being ourselves. Overflowing with incredible wonder. Welcoming such in ourselves and others; we are invited to remember that with God, that’s what it means to be great. This entry was posted in Sermons and tagged 23 September 2018 sermon, A Child as a Symbol of what to Welcome, Authenticity, Being Authentic, Children, Cultural Values, Discipleship, Following Christ, Learning from Children, Mark 9:30-37, Reliance on God, Servant of All, The Essence of Children, True Greatness, Welcoming the Child, Wonder on September 25, 2018 by RevJule.